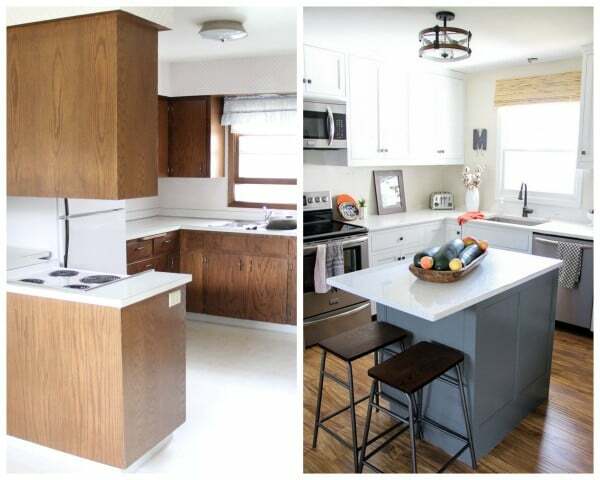 This post highlights how we were able to remodel a kitchen on a budget! Our kitchen is SO close to being done that I get to share the reveal! This little kitchen has come a LONG ways in the four months we’ve lived in our Retro Ranch. 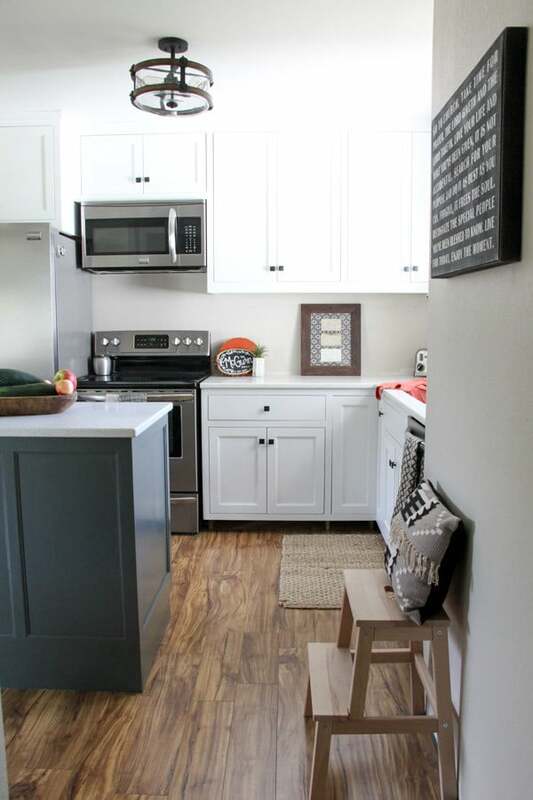 We’ve gone every step of the way pinching our pennies and watching our budget so today I want to share how YOU can remodel a kitchen on a budget! 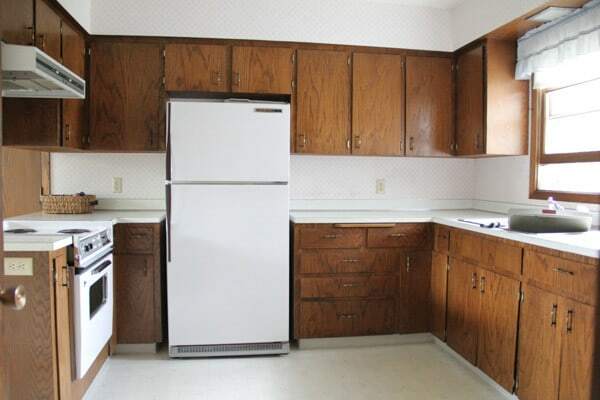 This is what we started with, a sad seventies kitchen that didn’t have a microwave, dishwasher, pantry, or an island. 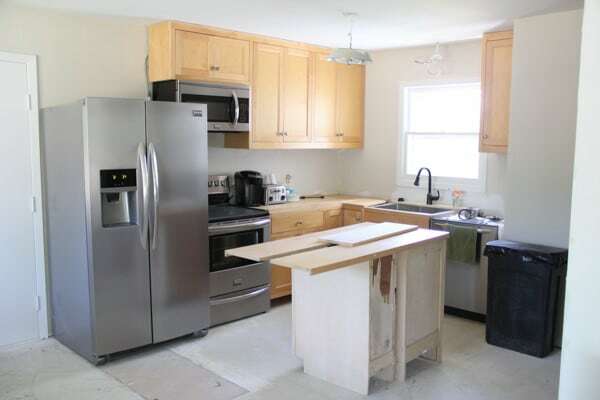 My first tip for remodeling on a budget starts back to when we gutted the kitchen. We were able to get the demo done for free by giving away the old cabinets to anyone who was willing to demo them. We also sold the old appliances, putting $50 into our reno budget. 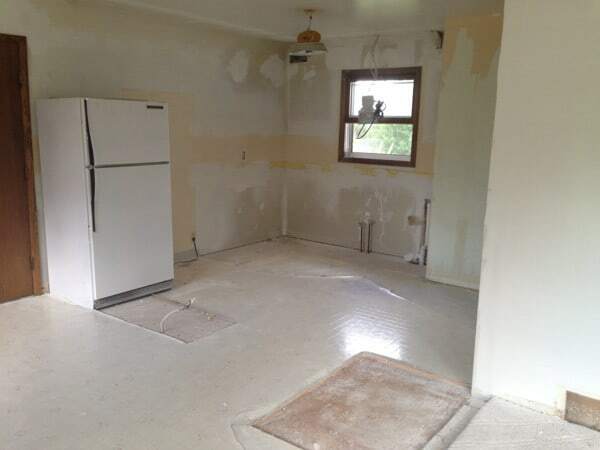 After gutting the kitchen, we saved a ton of money by purchasing our new cabinets on Craigslist! We also bought new appliances really affordably by watching for the cheapest price around, then having Lowe’s beat it by 10%. We also used a 10% off coupon at Lowe’s. 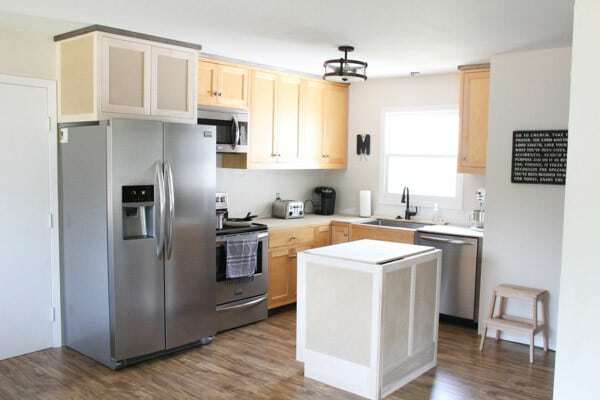 I shared an entire post on how to buy appliances affordably. 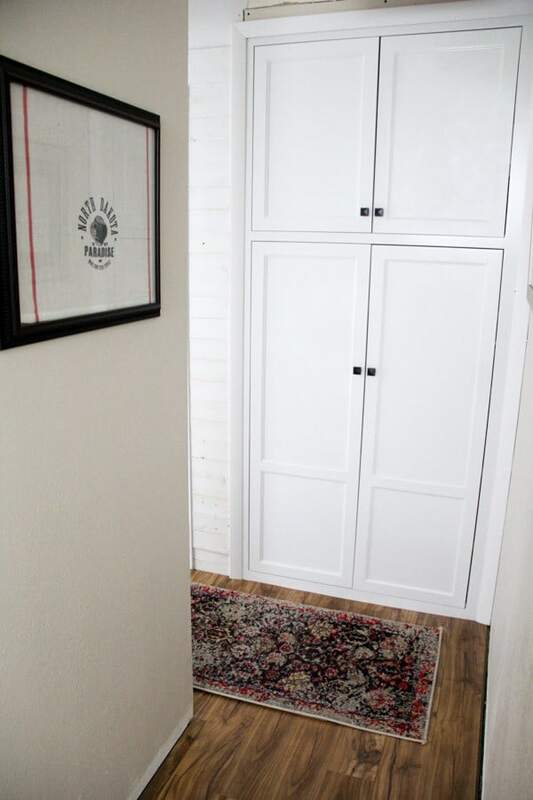 Because the cabinets were not built for this house, we did have a carpenter build us one cabinet, as well as build side panels and some other small tweaks. This was still FAR cheaper than buying new cabinets. Then I painted all the cabinets, costing under a hundred dollars by doing all of the work myself. The colors are Benjamin Moore Winter Snow and Sherwin Williams Night Owl. For countertops I LOVED the Silestone that we put into our last house, but it was out of our budget this time. Instead we went with Quartz from Menards that we measured and installed ourselves. It took two templates and about 6 weeks, but in the end we got all the countertops for about $1200. Down the hallway we saved a lot of money by using one of our Craigslist cabinets to create a pantry by stealing from the back of a closet. 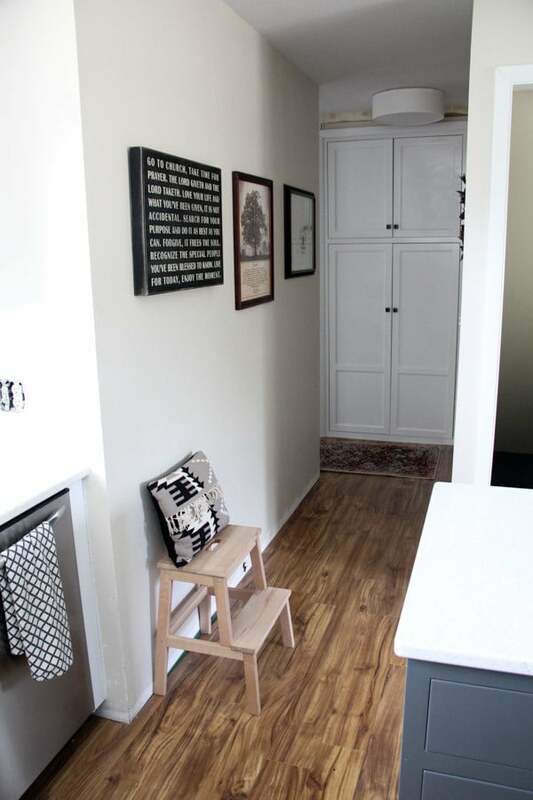 In our last house we also created a super affordable pantry by DIY’ing one. 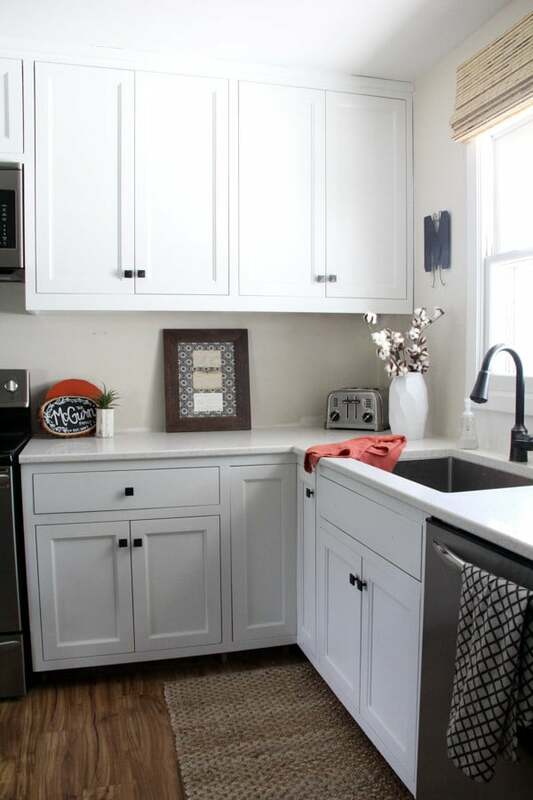 We replaced the cabinets original knobs with these, that we bought affordably online. 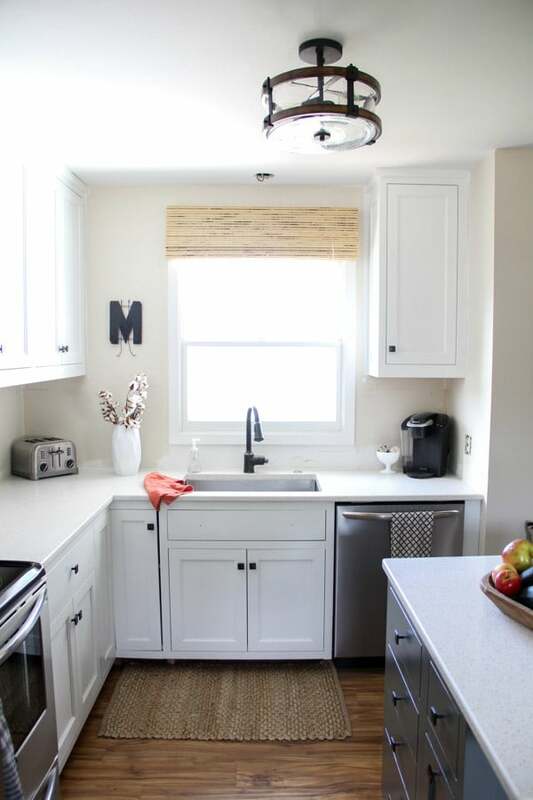 This kitchen is small but packs a lot of punch. We were able do a lot of the plumbing and electrical work ourselves, and ended up only spending about $150 to have an electrician add a circuit for the dishwasher. I LOVE having the prep space of an island, but didn’t have room for stools on the backside. Instead we made a 13″ overhang with room for two stools on the end. Another tip for how we did everything so affordably is that we shopped for our lighting, plumbing, and knobs online. By shopping each item hard we spent less than half of shopping retail. We still have to do some caulking, install a backsplash, and finish some details, but for now this kitchen is just perfect. I’ve read that the average cost of a kitchen remodel is $19,588. 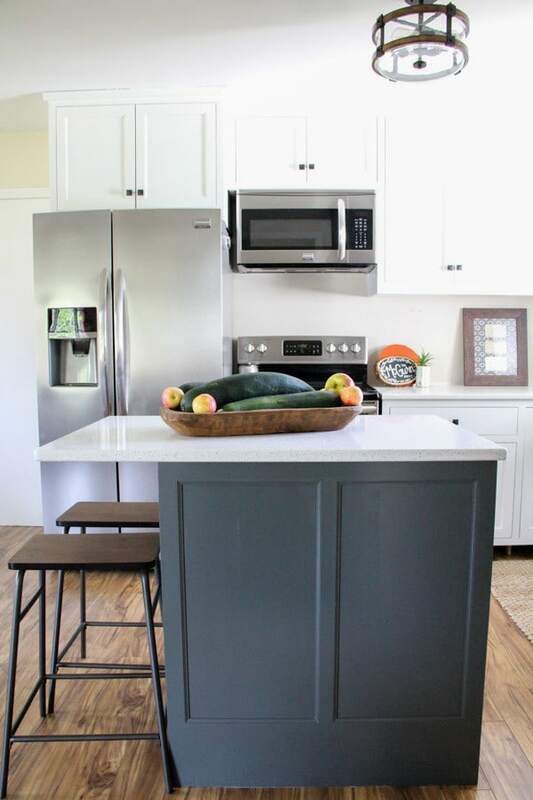 After the Craigslist Cabinets, Carpenter, Appliances, Countertops, Electrical and Plumbing Fixtures, Knobs, and a percentage of the flooring, ours came in just under $6,000. Although that’s far from pennies, for replacing EVERYTHING I’d say we did pretty good! On our last house we were able to keep the same cabinets, but after replacing everything else I think we spent about the same amount. 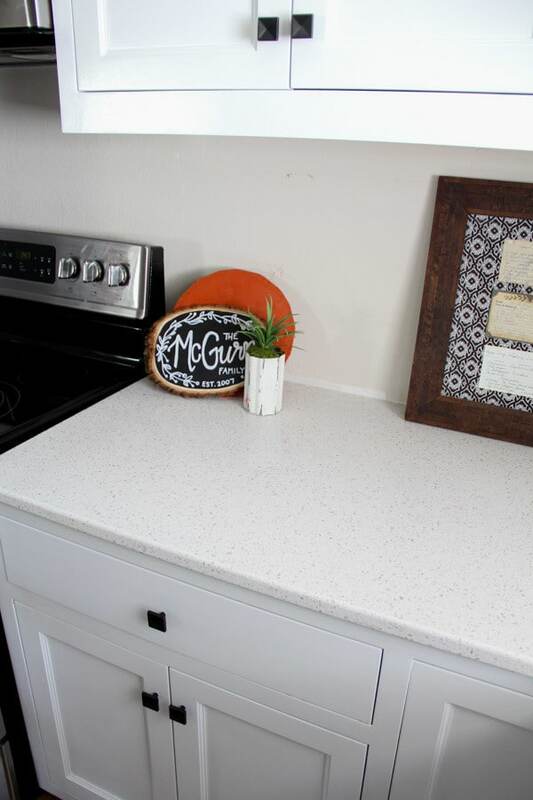 If you’re looking for some SUPER cheap updates, our first house kitchen came in well under $1,000 and still looked awesome! 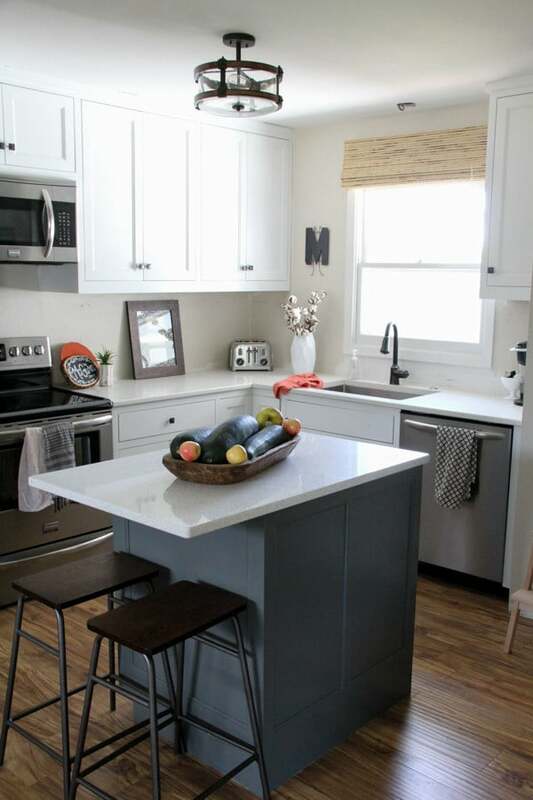 So do you have your dream kitchen or could yours use some affordable updates? Even if you can’t afford to do it all you can always take it one step at a time. Start out with a fresh coat of paint and new hardware and then take it from there! Even a new faucet or light fixture can make a huge difference! 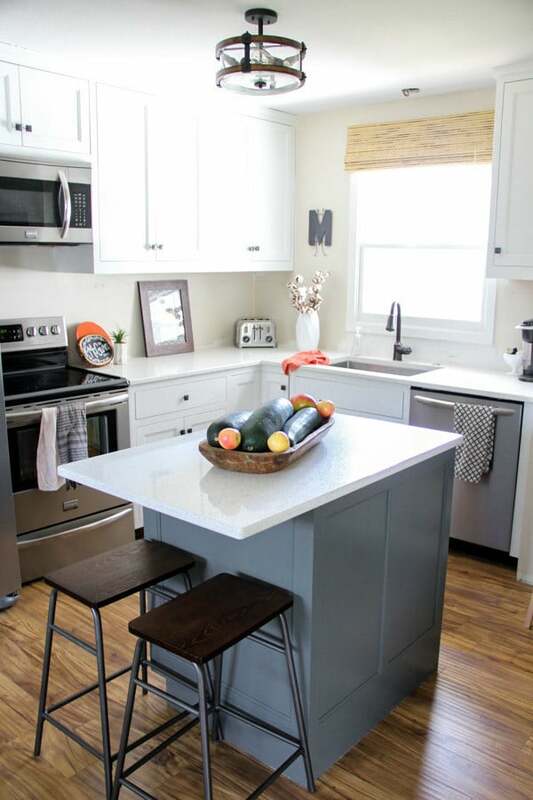 This is me encouraging you that you can have a kitchen you love on ANY budget! Aw thank you! It was a fun little kitchen! Sadly we moved so fast we barely got to enjoy it!